Intel’s fast-growing data centre business missed Wall Street targets as the world's second-largest chipmaker faced stiff rivalry from Advanced Micro Devices, and it again delayed the release of its next-generation chips until the end of 2019. The company's shares fell almost five per cent in extended trading. Sales to data centres that power mobile and web apps, which bring more profit than chips for personal computers, rose 26.9 per cent to US$5.55 billion in the second quarter ended June 30. Analysts had expected revenue of US$5.63 billion, according to financial and data analytics firm FactSet. Intel has been increasingly catering to data centres as revenue from PCs has flattened since shipments peaked in 2011. "We believe performance within Intel's data centre business largely dictates the performance in the shares and view the slight miss versus consensus as a negative," said CFRA Research analyst Angelo Zino. AMD, which has been gaining ground with its new server chips, beat estimates for quarterly profit and revenue on Wednesday, powered by its EPYC server processors. On a conference call with investors, Intel interim CEO Bob Swan said the firm expected PCs with its next-generation 10nm chips to be in stores during the 2019 holiday season. Murthy Renduchintala, Intel's chip architecture chief, said on the call that 10nm data centre chips will be released "shortly after" the consumer PC chips. Last quarter, the company said the 10nm chips were being pushed from 2018 to 2019 but did not specify when. Intel originally predicted the chips could be ready by 2015. The compares to rival Taiwan Semiconductor Manufacturing expecting 7nm chips to contribute more than 20 per cent to its revenue next year. But costs of the 10nm chips are also expected to put pressure on margins, company executives said. Another challenge to margin growth is an expected increase in sales of Intel's less-profitable modems that help mobile phones connect to wireless data networks. Earlier this week, Qualcomm executives said they believed Apple had selected Intel to be the sole supplier of modem chips in the next generation of iPhones. Apple and Intel did not comment on Qualcomm's claim. Several analysts on Intel's earnings call expressed concern that its gross margin growth might slow in the fourth quarter, when Apple ships most of its iPhones. Intel executives did not mention Apple or the iPhone but acknowledged those chips are not as profitable as some of its others. Intel's net income rose to US$5.01 billion, or $1.05 per share, from US$2.81 billion, or 58 cents per share, in the year-ago quarter. Excluding items, the company earned $1.04 per share, beating expectations of 96 cents per share, according to Reuters. The company benefited from a stabilising PC market, in which worldwide shipments grew for the first time in six years, according to research firm Gartner. 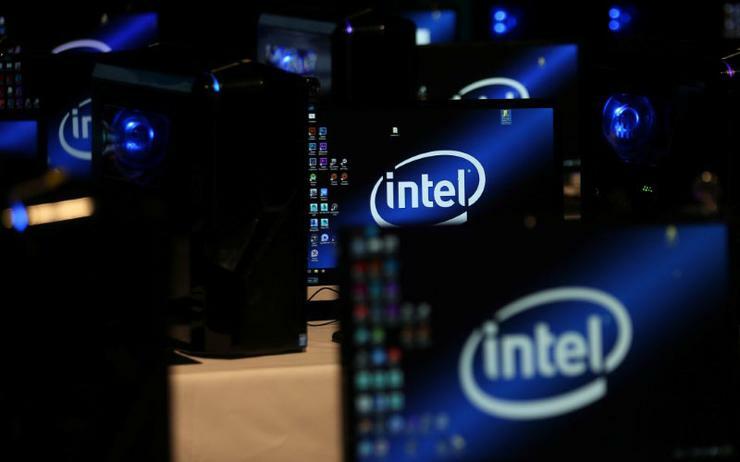 Revenue in Intel's client computing business, which caters to PC makers and is still the biggest contributor to sales, rose 6.3 per cent to US$8.73 billion, beating FactSet estimates of US$8.48 billion. Intel forecast current-quarter revenue of US$18.1 billion, plus or minus US$500 million, and adjusted earnings of US$1.15 per share, plus or minus five cents. Analysts on average had expected revenue of US$17.60 billion on a profit of US$1.08 per share, according to Reuters. Net revenue rose 14.9 per cent to US$16.96 billion, above estimates of US$16.77 billion. The company is searching for a new chief executive after Brian Krzanich was ousted last month following an investigation that found he had a consensual relationship with an employee in breach of company policy. Intel CFO Robert Swan is acting as interim CEO. Shares of the Santa Clara, California-based chipmaker which have gained 13 per cent so far this year, fell 4.6 per cent to US$49.75 after the bell.